Good preparation is the key to a great lawn and begins by digging the area a spade deep, removing perennial weeds and their roots as you go. Tough weeds like ground elder can be sprayed with herbicide – glyphosphate will leave no harmful residues in the soil. Coarse grit mixed with the soil will aid drainage and a good helping of manure will be a real benefit. Levelled and raked the soil can be left for a couple of weeks and any weeds that appear can be picked off or treated with herbicide. Then, in the manner of great gardeners, tread the whole area firmly in your boots, rake and check levels, tread again and when you’re happy you can sow or turf in September. 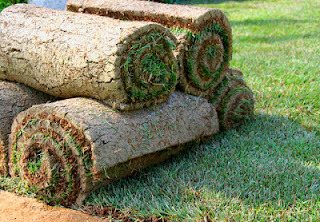 Turf can be laid straight onto the level soil after growing weeds have been dug out. Weed seeds will be smothered by the turves. Stagger the turves in alternate rows and beat them firmly onto the soil with the back of a spade. Brush fine, sifted, soil into any cracks.